The British Gazette » Brexit: A tale of two cities. Above, the 1,441-room Baroque palace Schönbrunn Palace in Hietzing, Vienna. There is a lot to get through. In his blog-post today (http://eureferendum.com/blogview.aspx?blogno=87057), one man who has read, learned and inwardly digested the text is the excellent Doctor North describes in an accurate summary what this organ feared all along – that the transition or implantation agreement would place the formerly sovereign United Kingdom of Great Britain and Northern Ireland in a position that can accurately be described as de-facto dependent territory status! Only last Sunday most of the ordinary people of this country were imbued with a deep sense of solemnity as they remembered the Armistice of those millions who gave their tomorrows for our todays. It seems a wholly pointless exercise in constitutional pedantry to point out such documents as the Declaration and Bill of Rights 1688/1689, the Privy Council oath and of course the Coronation Oath! No doubt such as Rodney Atkinson will on his website (http://freenations.net/) concur with the above statement about the violation of the British constitution. However they would be wholly wrong to claim that Donald Tusk President of the European Council is some sort of latter day Louis XIV. The FACT is that whilst the draft agreement has been cleverly and deceptively written in such a manner as to give it no end date – a cause of Mr Rees-Mogg’s wholly justified fury – it is intended to be TEMPORARY. Nobody in the European Commission expects the UK to be permanently in the position of a dependent territory of the European Union! In our previous posts we have speculated on various possible Brexit outcomes and have sought to analyse and explain the motivation for Madame’s actions. We have alternatively suggested that Madame is either a fool or a fraud. It could however be that she is a gambler and a very high stakes gambler at that. This is because whilst the term “dead parrot” was ascribed to the Chequers Plan (because the EU had rejected it immediately upon receipt of it) the term “dead duck” can seemingly be described to the draft agreement. Readers will recall how this organ speculated that far from being a fool, Madame may have been playing Comrade Corbyn, putting him in the position of causing a crash Brexit – and not her! You see, Article 50 – as this organ has repeatedly stated – is a terrible clause and the two year ticking clock, combined with four decades plus of integration of the UK economy into the EU places the UK in a perilous position where failure to reach an agreement cab bring about a crash Brexit – which would be catastrophic. The practical effect of Article 50 is to place any member state that has the temerity to leave the EU in a very weak position! Brexiting under Article 50 inevitably contains the danger of the chaos of a no deal Brexit. Madame of course was wholly aware of this on 24th June 2016! The one thing that Madame wants to do is to make sure that IF a crash out Brexit occurs she has someone to point the finger of blame at. And dear old Comrade Corbyn appears to be placing himself right in that position! Just where Madame wants him to be! You see, the thing about dear old Comrade Corbyn, is that like Morecambe and Wise, he is part of a two man double act! His partner in the noble proletarian cause being Comrade McDonnell! You see, Comrade McDonnell – unlike such as Dimwit Davis – is in fact a very capable fellow. Comrade McDonnell will have read the 585 page text and have formed the CORRECT conclusion that this draft agreement can in fact be described as the Banker’s Brexit! At which point our fervent socialist friend probably had to reach for the blood pressure tablets! You see, this draft agreement actually GIVES (we apply this word to the text advisedly!) the UK something the EU Commission said was unavailable – namely a single market in goods! NB: The EU has said all along that Europe à la carte was NOT on the menu! That if Madame wanted a single market in goods it had to come with a single market in services! And also with a serving of free movement of people! Following the notification of Article 50, the mainstream media reported upon banks and financial institutions setting up operations in the Eurozone to handle transactions and business that they presently/used to handle in London. This accompanied by a lot of wailing and gnashing of teeth from the Remoaners! The reason why Madame will have held out negotiated this concession – and yes, it is – is that she is fully aware that many politicians and business-folk in the EU look enviously at the City of London and would dearly like to in the case of the politicians tax it (with EU taxes) or to possess it (have Frankfurt or Paris a world financial capital – there are de-facto two: New York and London). The City of London can truly be described as the goose that lays the golden eggs that HM Treasury regularly banks! However, this is not a wholly satisfactory situation – which brings us to our choice of image at the top of the post! Austria a nation state of some 32,386 square miles and a population of 8,857,960	. By comparison, Greater London (a county of England) has an area of some 606 square miles and a population of 8,817,300. 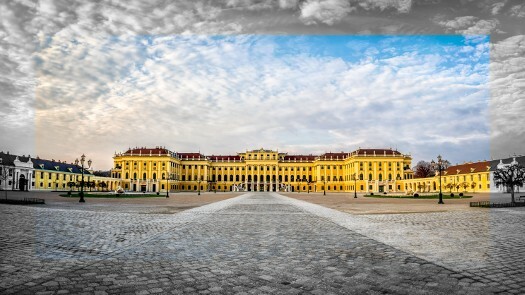 The Schönbrunn Palace is on the “to see” list of most tourists to Vienna. Along with sampling the Viennese cakes! Vienna can be described as a city of Imperial splendour. That is because until November 1918 it was the capital of the Austro-Hungarian Empire – a much larger multi-national empire. Now, the Austrians capitalise on their splendid buildings of their Imperial past to attract visitors – an income – to their small country. This like any tourist business has a high degree of seasonality about it, but otherwise is not a risky industry. The same cannot be said of the City of London and the financial service industry. The British people got a taste of the downside in the financial crisis of 2008. You see, as Sad Vince of that Cable CORRECTLY points out, the City of London and it’s financial centre is the one thing that this country has kept of the old defunct British Empire! One hundred years ago this nation was a superpower. Now it’s place has been taken by the USA. And such as President Macron want the EU to take it’s place! What we have in the City of London is a financial behemoth of a superpower but without being the capital of a superpower. This is all very well so long as things tick along smoothly. It is when things go awry when the problems occur! You see, the City of London is a very large part of the overall UK economy. Many such as Sad Vince state it is too large – in relation to the size of the UK economy. Sad Vince’s ideal answer would be for the UK to remain in the EU, join the Eurozone and for London to take the place of Frankfurt as the EU’s financial centre. Of course, Frau Doktor Merkel is of a different opinion! Thus what the draft agreement does is to enable the UK to retain control over the City of London. But at a very heavy price! But of course, we MUST remember that this draft agreement is the withdrawal agreement. Notwithstanding it’s deceptive drafting, it is a temporary agreement! Madame clearly intends that the permanent agreement retain the single market in goods WITHOUT having to accept a single market in services! But in order for the draft agreement to take effect, she must get the House of Commons to agree to it! #2: a second referendum with the binary choice: crash Brexit or withdrawal of Article 50! - Death by combat (the opponent being a mean looking bipedal reptile some 20 foot tall *All 20 foot tall bipedal reptiles are mean looking! – Ed). Needless to say, the ever resourceful and gallant Captain Kirk managed to get our hero out of his predicament to the safety of the USS Enterprise! Sadly for Comrade Corbyn, if the roof of a crash Brexit falls down around him, there will be no Captain Kirk to rescue him! There will of course be Madame – who will be trying her best not to smirk! In these circumstances one is tempted to wonder if Comrade Corbyn will be thinking of Sydney Carton?